Introduction: Type-2 diabetes is a growing health problem worldwide. India has become the diabetes capital of the world. Diabetes requires continuous medical care and education for patient self-management to prevent complications. As self-care activities demand enormous efforts from the patient, there is a necessity to learn their experiences about the hardships they face while self-managing diabetes. Objectives: The main objective is to evaluate the self-care activities along with perceived barriers among patients attending a health centre in a slum of Kolkata. Materials and Methods: This study was conducted in Urban Health Unit and Training Center, Chetla, Kolkata, among 10 male patients of type 2 diabetes for >2 years attending noncommunicable diseases clinics using focus group discussion. Results: Patients with diabetes aged 38–57 years. All of them lived in the slum area. Their duration of diabetes ranged from 2 to 17 years. Most of the participants stated that they suffer from diabetes because of excess “chinta,” that is, worry or stress. They opined that diabetes affected every single part of the body irreversibly. According to the participants, walking, appropriate diet, timely medicines, regular blood glucose monitoring, and stress are to be reduced to control diabetes. Conclusion: Participants were aware of diabetes self-care activities though they lacked knowledge in few domains. Their practice was satisfactory. The patients were distressed due to diet restrictions and felt stress as a main factor in their lives. Diabetes mellitus (DM) is a common and growing health problem worldwide. It is a syndrome characterized by many disorders where there is increased blood glucose concentration due to lack of insulin. Diabetes has serious long-term implications not only for the individual or the country but globally. Today, there are an estimated 371 million adults living with diabetes. Four out of five of the people with diabetes live in low- and middle-income countries, where health systems are struggling to keep pace with the growing burden of noncommunicable diseases (NCD). The human and economic toll of DM, particularly type 2 diabetes is likely to grow globally in the foreseeable future due to rapid cultural changes, aging population, increasing urbanization, dietary changes, decreased physical activity, and other unhealthy lifestyle and behavioral patterns. With this background, this study was conducted to evaluate self-care activities along with perceived barriers among diabetes patients attending a health centre in a slum of Kolkata, West Bengal. To collect data until the point of saturation according to their perceptions and beliefs as well as sudden disclosure of new information. (Sudden disclosure of new information means any information during the post-FGD session nonformal interaction. This was noted down as well and considered during thematic analysis). A meeting was held among the researchers and experts in community medicine and health education to prepare an appropriate discussion guide with short, well-constructed, and understandable questions in simple language in local vernacular. Permission from the local health authorities and the Institutional Ethics Committee was taken to perform the research work. A moderator was identified who was trained and experienced in conducting FGDs on the said topic. Two separate notetakers were involved in the process of note-taking. UHUTC, Chetla, is the urban field practice area of All India Institute of Hygiene and Public Health, Kolkata, which runs special NCD clinics twice a week where patients receive free drugs and services. The study participants were patients with type 2 diabetes that attended the NCD clinics on March 7, 2017. The inclusion criteria were having been diagnosed with type 2 diabetes for at least 2 years and being aged between 35 and 60 years. Patients who were not in a good physical/mental condition during the study time were excluded from the study. As the aim of the study was to describe the day-to-day self-care practices of patients with diabetes, newly diagnosed patients were not included in the study. The doctors and nurses working in the clinics helped in identifying patients who fulfill the inclusion criteria of the study. The participants were selected from the queue at NCD clinic. Each patient was approached and explained regarding FGD. Those who consented to participate were included. Before the session, they were informed about their autonomy, confidentiality, and right to leave the study at any given point of time. Informed written consent of all the participants were obtained before taking part in the study. A semi-circular sitting arrangement was planned to ensure there was a good communication between the study participants and interviewers. The FGD was conducted in the local language of Bengali which is spoken and well understood by all study participants. A set induction involved greetings, icebreaking, and was followed by the discussion proper. Questions were asked to the group and each participant was given an opportunity to respond. Every cue of nonverbal communication such as nodding was also documented. Questions were asked until there was no new information that was generated from the study participants. The group discussion lasted for about 90 min. A sociogram was used to keep a record of conversation and participation. At the end of FGD, the study participants were given an opportunity to ask questions and their queries were answered. For better reliability, it was ensured that all persons involved in conducting the session of FGD except the moderator refrained from talking and the notetakers produced notes in the exact verbatim. There were 10 male patients with diabetes aged 38–57 years. All of them lived in the slum area. Their duration of diabetes ranged from 2 to 17 years. 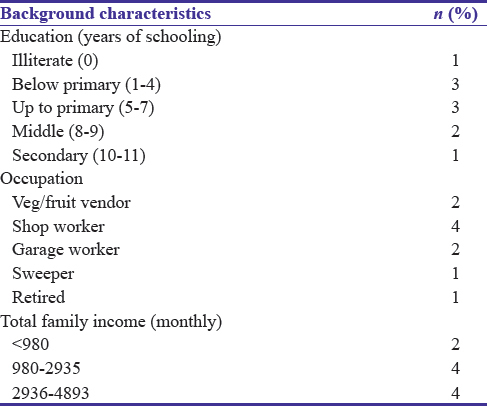 Only one participant studied till secondary [Table 1]. The collective thoughts, views, and experiences of the 10 male diabetic patients were analyzed to reveal the following themes. One of the participants mentioned that he was first time diagnosed with diabetes when he had developed an abscess in the foot, for which he consulted a doctor and got investigations done. Another patient, an electrician by profession shared that he was first discovered with diabetes when he was admitted in the hospital following a major accident. The accident was due to reeling of his head. One of them discovered diabetes when he underwent a surgery for a tumor. Others were incidentally diagnosed while doing routine blood investigations. On asking the probable cause, all of them related to the occurrence of diabetes with preceding or ongoing stressful event or so, in their lives. Most of the participants stated that they suffer from diabetes because of excess “chinta,” that is, worry or stress. As stated, the cause of stress was death of a loved one. The causes varied but most were due to emotional stress which led them directly or indirectly to consult doctor and get their investigations done. The symptoms of stress led them to reeling of head, in 2 cases even led to the accidents for which they got admitted. Decreased work capacity, low back pain, knee pain, hardening of joints of fingers, and increased lethargy and sleep were among other symptoms reported. All of them opined that nerve problems, tingling sensation, and paralysis are the definite effects of diabetes. According to the participants, walking (physical activity), appropriate diet, timely medicines, regular blood glucose monitoring, and stress are to be reduced to control diabetes. Any kind of addiction is to be quit. Foot care and eye care was not mentioned by anybody. Few participants were distressed saying that every food is restricted. As diabetes makes one more hungry, diet is to be controlled. “If we eat 4 chapattis, we should eat 2 instead.” They also opined that amount of rice should be reduced. Potatoes, carrots which grow underground should be avoided. Green leafy vegetables, vegetables such as ladies finger, brinjal which grow above the soil can be consumed. Although few opined that cabbage, cauliflower should be avoided others did not affirm. Vegetables should be boiled, the water to be discarded and then consumed. Sweet fruits such as mango, chiku, pomegranate, and banana are to be avoided, though they grow above soil. “Direct” extra salt should not be taken. Salt should be used during cooking. Oily and spicy food should be avoided. Sweets must be avoided. The participants unanimously believed that “decreasing stress can uproot diabetes.” Not only stress is the cause of diabetes but diabetes management also makes them irritable. ”We have to free our mind and reduce “chinta”. Stress shall be there as they all have families and responsibilities but doing “jog-vyayam” could reduce it.” Talking to everyone with a smiling face can relieve oneself also others, of stress. Some participants shared that though they know walking is necessary, they cannot find time to do so due to work pressure. A participant who was a shop owner by occupation shared that as he does not get time, so he walks inside his shop only. Others do physical exercise inside their houses early in the morning before leaving for work. On asking whether they were advised to quit addiction, all unanimously agreed. They knew that addiction worsens diabetes. Some patients who consume tobacco confessed that they could not quit in spite of advice. Some patients did leave alcohol but still chewed “gutkha.” They believed alcohol is more harmful than bidi. The participants monitored their blood glucose only when advised by the doctor. Two of the participants were vigilant to do their blood monitoring every month without fail. One of them monitored every 2–3 months. Everyone reported that they were not aware of foot care as a part of diabetes management. However, they agreed that no cuts or injuries should be there. Walking barefoot on the grass was beneficial, especially in the morning when dew falls. But chances of injury are more so slippers should be worn every time. All the participants said that they were not advised for regular eye checkup though they knew diabetes affects eyes. In the present focus group study, there were 10 male patients suffering from diabetes for the past 2 years. The areas of discussion are as follows:-diabetes, the silent disease, knowledge regarding complications of diabetes and self-care practices and barriers faced and stress as a central issue. The patients shared their past history explaining how they were diagnosed with diabetes for the first time. For most of the patients in this focus group, there was some preceding medical event, for which they went to the doctor and diabetes was diagnosed accidentally. For one patient, diabetes was discovered late as he sought medical advice apparently for a nonhealing diabetic ulcer. Had these individuals been aware of the risk factors of diabetes, the diagnosis could have been much earlier. If these patients were previously aware, prevention could have been done. On asking the probable cause of diabetes, all the participants reached a consensus that “chinta” or stress was the underlying cause or precipitating event. As they described, it was emotional stress which affected them the most whether directly or indirectly. In one case, the excessive worrying lead to carelessness which leads to an accident, for which he was admitted to a hospital. During the laboratory investigations there, he was found to be diabetic. This FGD revealed that the participants had a fair amount of knowledge of the adverse effects of diabetes on the body. They mentioned that the kidney, heart, and neuromuscular system were most commonly affected due to diabetes. One patient also emphasized that this disease is an incurable one and that proper self-care management was the only way to control the progress of the disease. They were aware of the severity of the disease as well which indicates that not only they were well informed but also they were motivated as well to live with diabetes amicably. This positive attitude forms the foundation of a good self-care practice by the patients with diabetes and could be attributed to their regular visits to the NCD clinics where health promotion and education regarding diabetes is been given. None of the participants were aware of all the self-care domains of diabetes management. They could correctly mention dietary modification, regular physical activity, regular blood glucose monitoring, quitting addiction, and timely intake of medicines as domains of self-management. However, none of them neither knew nor practiced foot care as a part of diabetes self-care. Furthermore, importance of eye care was not known to them. It was observed that all the participants strongly believed that stress management is an essential part of diabetes management. The patients had fair knowledge of type of dietary modifications needed to be made. Few had made peace with these changes and were following their self-care routine. However, it was observed that many participants were quite distressed about dietary restrictions and were struggling. They found themselves irritable owing to the change from a normal diet to a tasteless one. They had a belief, we call it the “soil concept.” The patients believed that vegetables growing below the soil should not be consumed. In addition, some wrongly believed that cabbage, cauliflower, etc., cannot be consumed. These myths were gathered from the neighbors, friends, etc., which had affected their diet. Similar notion of dietary struggle was observed in a study done by Bhattacharya. Although all the participants believed that physical activity was important, many reported that they were unable to exercise regularly due to lack of time. However, there were some patients who used to walk inside their respective shop or workplace. Furthermore, few had begun exercise early in morning. These experiences reflect that they were well advised regarding regular exercise and are trying their level best to manage their disease. More than half of the study participants were addicted to either tobacco or alcohol or both. They confessed that quitting was one of the toughest behaviors. Some had quit alcohol but continued on tobacco though they were aware that addiction could worsen diabetes. These findings were similar to that of Lin et al. in Taiwan. Although not regular, the participants monitored their blood glucose. Many followed doctor's advice for testing. Some were themselves vigilant about the investigations. None of the participants mentioned foot care as a part of self-care practice of diabetes. When probed in, they mentioned that one should avoid cuts or injuries on the foot and use slippers. They were not advised to take care of their foot by the physicians conducting the NCD clinics. Furthermore, the knowledge of regular eye checkup/fundoscopy was lacking. This focus group revealed that patients with diabetes felt that managing stress was very important to manage diabetes. They opined that stress might indeed be the trigger for diabetes. The participants admitted that the routine of diabetes self-care had made them irritable which adversely affected their blood glucose levels. This indicates that diabetes distress is slowly creeping into their lives. Some of them suggested that doing yoga, exercise, and talking to everybody with a smiling face could reduce stress. It was noted that most participants in the study had reached a degree of acceptance of their disease. They were eager to learn more and more ways to control diabetes. Although they struggled with dietary modification, quitting addiction or the whole self-care routine, none of them had given up. It was inferred that this optimism toward diabetes self-care was inculcated through the attending physicians and health staff at the NCD clinics. There were few gaps in the knowledge of foot care and eye checkup and also certain myths regarding diabetic diet. This must be bridged through proper and regular health education. It was observed that some patients were on the verge of developing diabetes distress owing to overwhelming self-care routine. Hence, regular counseling and yoga sessions should be organized so that diabetes self-care is no more a struggle for them, but a way of life. The above qualitative study has provided insight into the lives of the diabetics from their point of view which any other method could not have presented this authentically. To conclude, the participants were aware of diabetes self-care activities though they lacked knowledge in few domains. Their practice was satisfactory as per the level of their knowledge. The patients were distressed due to diet restrictions and felt stress as a main factor in their lives. Therefore, the attending physicians must ensure adequate advice and motivate the patients continuously, so that they can adapt to diabetes successfully in their lives. We acknowledge the Officer-in-Charge, UHU and TC, Chetla, for giving us permission to conduct the research work among the patients with diabetes. We acknowledge and appreciate all the patients with diabetes involved in the FGD who graciously shared their precious experience and time. Diabetes Epidemic out of Control, Press Release, International Diabetic Federation; December, 2006. Available from: http://www.IDF. [Last accessed on 2017 Apr 25]. World Health Organization. What is Diabetes? Report on Medication Adherence. Geneva: World Health Organization; September, 2005, 2006. Available from: http://www.who.int/mediacentre/factsheets/fs312/en/print.html. [Last accessed on 2017 Apr 25]. American Diabetes Association. Standards of medical care in diabetes–2011. Diabetes Care 2011;34 Suppl 1:S11-61. AADE. AADE7 self-care behaviors. Diabetes Educ 2008;34:445-9. American Diabetes Association. Standards of medical care in diabetes–2010. Diabetes Care 2010;33 Suppl 1:S11-61. American Diabetes Association. Evidence-based nutrition principles and recommendations for the treatment and prevention of diabetes and related complications. Diabetes Care 2002;25:202-12. Sigal RJ, Kenny GP, Wasserman DH, Castaneda-Sceppa C. Physical activity/exercise and type 2 diabetes. Diabetes Care 2004;27:2518-39. Povey RC, Clark-Carter D. Diabetes and healthy eating: A systematic review of the literature. Diabetes Educ 2007;33:931-59. American Diabetes Association. Standards of medical care in diabetes–2009. Diabetes Care 2009;32 Suppl 1:S13-61. Deakin T, McShane CE, Cade JE, Williams RD. Group based training for self-management strategies in people with type 2 diabetes mellitus. 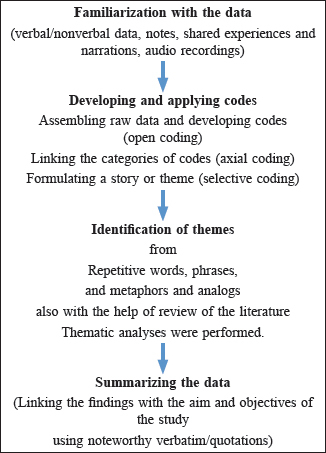 Cochrane Database Syst Rev 2005;2:CD003417. Shobana R, Augustine C, Ramachandran A, Vijay V. Improving psychosocial care: The Indian experience. Diabetes Voice 2005;50:19-21. Loganathan AC, John KR. Economic burden of diabetes in people living with the disease; a field study. J Diabetol 2013;4:5. Bhattacharya G. Self-management of type 2 diabetes among African Americans in the Arkansas Delta: A strengths perspective in social-cultural context. J Health Care Poor Underserved 2012;23:161-78. Lin CC, Anderson RM, Hagerty BM, Lee BO. Diabetes self-management experience: A focus group study of Taiwanese patients with type 2 diabetes. J Clin Nurs 2008;17:34-42.